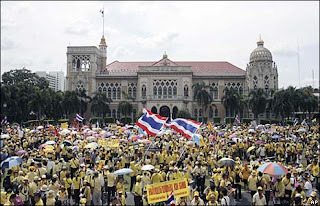 By now, the whole world knows about Thailand’s political protest. It is an interesting time to be in Bangkok now. Not that I know much about politics, let alone Thai politics. But I think from the situation, I see another side of Thai people that is very unlike the people I see everyday. The impression I have from Thai people is that they are polite, take things easily, and friendly, especially to foreigners. But when it comes to political ideas, I guess all hell breaks lose. There is a clash between the pro- and anti-government protesters early morning of Tuesday (2nd September 2008). One person was killed and dozens were injured in that incident. How can human being be so cruel as to killing each other just because of different political views. Are we human beings or animals? Is it worth it to die for your political belief? The person you support don’t even know you personally and you are willing to die for him? Is it stupid or what? Life is very precious, don’t waste it on political battle. Is the situation in Thailand is what we considered ‘democratic’ or just plain barbaric act? From my understanding, the current government is elected from election. They win the majority of the votes from the election. So, whoever wins, rules the country. Isn’t that the way democracy work? Perhaps I don’t know much about the way politics work. But I think I get the basic idea. So, I don’t know what the protesters are whining or complaining about. I was also amazed by the unity of Thai people. For the past week, there are a few unions that take action to force the prime minister to step down: the train stopped running, 80% of Bangkok public bus stop running, all schools in Bangkok are closed, water and electric authority stop supplying to police stations in the whole country and even Thai Airways stop their service and closed Phuket and Krabi airport to force the prime minister to step down. However, I didn’t hear anyone in my office discuss about the protest. The reason is that politics is a sensitive issue. You will never know which side does the person who you are talking to believe in. If you are on the opposite sides, you will end up having a fight. So, my friend gave me a piece of advise: don’t ask, don’t tell. p/s: Thanks to all of you who are concern about my safety here in bangkok. I'm fine here, business as usual, because the protest is not near the business district where I work. And I live out of downtown, so I'm ok.
hey you..its me..u know..the hot baker chick..lol..anyways..good to know you're allright..take care ya..remember..just run the opposite direction!miss ya!hugs hugs! politic is a complicated issue..... see what is happening back home. people r not as stupid as politicians like to believe them to be anymore. people are just frustrated with what has been happening since God knows when! Good to hear you're ok. This politics thingy happen quite often in Bangkok. When I bro was working there it happen too, what you see on TV is quite extreme but generally it is save somehow.